GoodReads: “Tessa Gray should be happy – aren’t all brides happy? OK! Let’s try again. HOLY SCHMOZY (liked that, it rhymed!) What a freaking awesome Nuclear end of series! I am completely blown away. 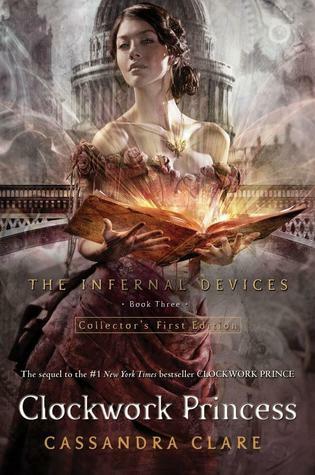 Clockwork Princess is such a beautiful, heartbreaking and emotional book… THIS, guys, is how you close a story and leave people like me completely speechless for hours, unable to process anything like a fly that lands on your nose and make me eat lots of ice-cream due to a book-induced depression. Jem and Tessa are engaged, Will is shocked and his sister appears years after he left home. After the ending of Clockwork Prince I was just left wondering for a whole year how this would end. I could never say I which team I supported, Will or Jem, because I liked them both. However I always tended to root for Will more. He deserved to be happy and he always made me laugh. Ok, I might be a little team Will. Just a little because Jem is so nice and romantic he obviously deserves to have a happy ending with Tessa, too. The book is, as I said before, beautiful but there was just a thing that I just couldn’t wrap my mind around. Will and Tessa love each other, blah blah, but their actions after a major event in the books just didn’t match with their personalities. The other thing that left me a little frustrated was that Cassandra Clare wanted all of her characters to have a happy ending and, in my opinion, the end of the epilogue just ruined the effect of, well, the epilogue. The ending was so heart wrenching and perfect in a way that the actual ending just messed it up. Yes, it opened doors to many things and made me think of what will happen in the next series “The Dark Artifices” but… Apart from that, it was the perfect ending to an amazing series.